Use your cell phone to browse, explore and manage files of any bluetooth ready device. Download, upload, explore, search, edit, create, delete and rename files and folders on your phone, pda, palm, notebook, pc, photo viewer, music player and so on; using an easy, fast and intuitive user-interface (gui). 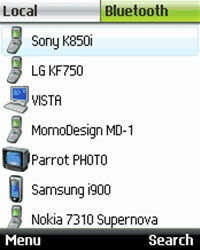 Transfer or delete many files and entire folders at once, with a single keypress, using the multiple selection feature. Search files across filesystems, using rapid and customisable parameters. Explore hidden files, or make your personal data private and/or read-only, using the attributes editor (local filesystem only). Cut, copy and paste files and folder across filesystems. Save your favorite devices in the bookmark list, to speed-up the connection procedure. Bluetooth File Transfer LITE is an utility that works under . It is Free so you can download it and share it with your friends. Estimated download time for Bluetooth File Transfer LITE on a common adsl connection is less than a minute. Version 1.70 was released three thousand forty three days ago by Medieval Software. Click the green download button to download it now.